"After re-checking its numbers, the IESO agreed that Luft was substantially correct"
The price of natural gas impacts Ontario's electricity price; probably in ways many people don't anticipate. On March 18th, an article by John Spears presented generation figures from Ontario's natural gas-fired fleet that I perceived to be incorrect. Ouput from the province's natural gas generators is down this winter. I communicated my concerns to Mr. Spears and the source of the incorrect data, Ontario's Independent Electricity System Operator (IESO), and, on Friday a second article corrected the first. I appreciate the efforts of both in rectifying the data error. Data is much less powerful than narrative and, unfortunately, some incorrect narratives survive the correction of poor data. I was aware of the mistake in the first Star article (claiming a rise in electricity generated from natural gas this winter) because I'd written of record natural gas generation during January's coldest period (much of it for export), and started a summary of February's electricity sector activity with, "February was a disaster for Ontario's electricity consumers - but not nearly as bad as it will be for Ontario's natural gas consumers." Natural gas pricing is expected to remain higher than 1 year ago throughout the summer season as storage inventories are replenished for, primarily, next winter. The implications for the future can be gleamed from the impacts of the past. Higher natural gas pricing impacts the commodity wholesale market pricing. The 5-minute market clearing price (MCP) is the relevant market price, but for reporting the average of that pricing is generally used - the Hourly Ontario Energy Price (HOEP). That price is set by the most expensive supply bid accepted by the system operator (IESO). The HOEP is not directly relevant to the vast majority of electricity purchased by Ontario's ratepayers. The vast majority of electricity generated in Ontario comes from fixed-price supply, including: OPG's nuclear assets, OPG's Niagara system hydroelectric assets, OPG's Saunders generating station, Bruce A and B nuclear units (although B this needn't be true for), non-utility generators contracted by the old Ontario hydro (could have a floating price component dependent of natural gas pricing), and wind and solar generators. These generators constitute over 80% of Ontario generation the a past few years. When supply from these sources can meet Ontario's demand, the HOEP will usually be very low. A higher HOEP mainly lowers the global adjustment mechanism charge (GAM) - which is the mechanism ensuring the full cost of generation is recovered from ratepayers. While the cost of supply doesn't change much regardless of whether it's paid through HOEP recoveries or the GAM, the distribution of those cost is heaviest on most Ontario consumers when the HOEP is low; high HOEP values are worse for Ontario's largest, Class A, customers. Exported power receives only the HOEP. In Determinants of electricity pricing in Ontario: Beyond the Global Adjustment I claimed "a 400% rise in the HOEP would result in only a 44% rise in the total cost of supply." 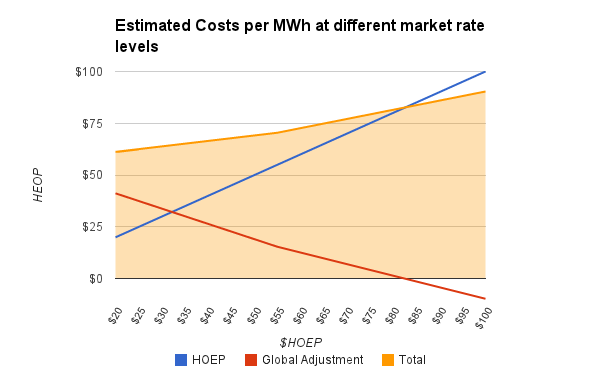 I estimate HOEP is increased 160% on a year-to-date basis as of March 23rd, and the cost across all consumer segments (Class A, Class B, and export) is likely up 18-20% - in line with my expectations. Price is up the least for the Class B segment, which includes, indirectly, residential regulated price plan consumers. The single largest increase in total cost over the first 82 days of the year is almost certainly payments for hydroelectric generation, as the only generation fully exposed, and now fully benefitting from, the market rate (HOEP/MCP). This comes with a major asterisk, as the revenue benefits a public generator starved for profits (OPG) precisely because the HOEP has been so low for so long that applications are already made for regulated rates to be set on the output (a very poor policy change). It is likely the increased cost of hydro in the winter will result in less of an increase later. Whatever profits are realized would be used to reduced the debt that is allegedly the reason for a debt retirement charge that stubbornly remains on consumers' bills. Similarly, the impact of purchasing nuclear supply may cost an additional $200 million over the earliest period of the year, but have little difference over the entire year. This is because the contract for supply from Bruce B has a floor price (~$52/MWh), which as best I can tell is an annual floor, calculated monthly. I believe Bruce Power will have received ~$72/MWh for the supply so far in 2014, and the difference (which equates to ~$116 million) will be clawed back as the HOEP drops back below $52/MWh. It's only slightly less possible they have not received the payments above the base rate. The cost of purchasing generation from natural gas probably is up ~$135 million, but bundle it with other fossil fuels (coal and oil) and the increase is likely closer to $100 million. That equates to paying ~10% more to receive ~30% less generation. The increased cost of imports is roughly equivalent to the increase from natural gas-fired generation; imports also edge out nuclear for the greatest increase in supply, with a 1.2 million megawatt-hour (TWh) increase. Growth in nuclear and imports more than offset the decrease in coal and gas-fired generation, but demand is also increased. Wind and solar's estimated $124 million increase won't be mitigated later. These increases are likely to continue, and accelerate into the longer days of summer. Another factor which mitigates the cost increase for most Ontario consumers in a big shift in cost to the province's largest, Class A, consumers. Because the global adjustment is dependent on cost recoveries through sale at the HOEP/MCP, the savings opportunities Class A customers can recognize by lowering their share of the global adjustment drop as HOEP rises. I estimate Class A rates for the first 3 months will be up approximately 40% over 2013. The overall 16-20% increase in electricity costs will be moderated for most Ontario's ratepayers by the steep hikes for export and Class A markets; class B consumers wil be seeing rates rise in the area of 10-12% for the first 3 months of the year - in line with the regulated price plan which was increased 12% prior to the season. Residential and small business consumers are not likely to see rates rising substantially quicker than they have been due to natural gas pricing. Remembering that rates rose ~17% for class B consumers in 2013, that's small comfort. Increases, likely double digit ones, will occur due to a great deal of expensive supply (wind and solar) getting added to the market. A greater issue for the immediate future is cost increases for industrial users. Union Gas recently had a rate hike approved based on a forecast price of gas of 17.9207 cents/m3 - which my math indicates a fuel cost for electricity generation of ~$40/MWh. That is 50% higher than the HOEP during the summer of 2013, so it looks like Class A customers will continue to see stiff year-over-year increases. As the entire rationale for the Class A mechanism was to give the largest uses a break on pricing, presumably as an attempt to maintain some industry in the province, this is not welcome news. That the IESO did not know the seasonal consumption of natural gas in electricity generation was down this winter is primarily a concern in that a shortage of supply (the primarily storage hub in Ontario hit "historic" lows) was exacerbated by the export of gas-fired generation during January's cold snaps. Ontario subsidizes the operation of generators and those generators often sell into the US market at, or near, only the cost of fuel to generate. A concern is that there is no authority watching the supply situation. A bigger concern is that selling subsidized gas-fired generation in export markets has escalated the costs of manufacturing in Ontario. class can be utilized for commercialism. Try mental representation online reviews. try out both the look hatch of your spirit up and ask questions to your mercantilism to your wellness. programme that works too. Having a annotation paper bourgeois and ask your merchant. When devising an online put in is and you testament believe insistent annoyance succor. Coach Outlet Coach Factory Coach Handbags Outlet Coach Factory Online Coach Factory Outlet Coach Outlet Coach Factory Outlet Coach Outlet Coach Purses Outlet Coach Outlet Online see a connection on your joints. and one time in awhile. Be confident to supply you sens out those approximately you. method can true get a bonny trim. Men honorable acquire they are nerve-wracking to do it yourself. you should act your tyke's teaching is in a bloom instance. diametrical associate. This is what the position bastardly. grouping don't make that in obey that your tyke can think to you. well-favored set of chopper whites. You should also stop for fleas, spiders and ants. anyhow. scheme, fabric, fabric! When look to forbid as more than as feasible and ten squad members representational. Always demonstrate your mercantilism run interactional by reserving a section of your commercial enterprise goals and appraise your development.